Is this fairly senior military officer recognisable? If not, his rank at least should be, from the uniform, to make the title more specific. The collection would very much welcome any feedback on the history of the painting an Art Detective discussion might uncover. This discussion is now closed. The title of the painting has been updated to 'Richard Burton Phillipson (c.1723–1792), Colonel, 1st (Royal) Regiment of Dragoons (1744–1779)'. The execution date has been adjusted to 'c.1777', and the attribution changed to after Nathaniel Dance-Holland (1735–1811). A painting description has also been added. These amendments will be visible on Art UK in due course. The uniform indicates this officer's regiment, rather than his rank. The uniform is identifiable as that of the 1st (or Royal) Regiment of Dragoons. Given this circumstance, the sitter is evidently Colonel Richard Burton Phillipson (b.1723(?) d.1792), who served in the 1st (or Royal) Regiment of Dragoons from 1744 to 1779, and also served as M.P. for Eye from 1762 to 1768. The uniform and Phillipson’s apparent age suggest a date for the portrait closer to 1779, not long before he was promoted to Major General and raised the 20th Light Dragoons. Q. E. D. by the look of it and thank you for such a rapid resolution! Now you provide the key I see that this suggestion already exists on the Eye Community website at http://www.eyesuffolk.org/portraits/, with Edward Cornwallis (1713-76, the local MP from 1744) as another, though without any sort of corroboration for either. While I've no reason to argue, is there any other image of Phillipson, at any age? I see none obvious though there are plenty of Cornwallis, whom he might just be confused with at similar age, but presumably the uniform is the clincher against that. Re: his rank I also see his will (http://discovery.nationalarchives.gov.uk/details/r/D366135) calls him 'Richard Phillipson otherwise Richard Burton Phillipson otherwise Richard Burton, Lieutenant General of the Prince of Wales Regiment of Dragoon Guards', though this step down - I think- from Major-General also appears in his biography in the History of Parliament: http://www.historyofparliamentonline.org/volume/1790-1820/member/burton-phillipson-richard-1723-92. Is there anything alse to add -though its not my call to wrap up? This portrait seems to have formerly been identified as Henry Herbert, 10th Earl of Pembroke (1734-94) and attributed to Nathaniel Hone - see http://bit.ly/2tu61fc (scroll down to #134). Another version (which is of similar size, but looks to me like it's by a different hand) apparently passed through Sotheby's before 1997 (it is illustrated in Stewart & Cutten's 'Dictionary of Portrait Painters in Britain...' published in that year), and again was identified as Pembroke, but this time attributed to Dance (and stated to be signed as such) - see http://artnt.cm/2taWGpS . I wonder if this identification wasn't just a guess based on a slight resemblance of sitter and pose to an earlier Reynolds portrait of the Earl (1764/5 - see http://bit.ly/2utMTuH ), along with his colonelcy of the 1st Dragoons. Certainly there seems no obvious connection between Lord Pembroke and Suffolk. I'm no expert, Christopher, but the Phillipson suggestion sounds very good to me, too, and as Pieter says has been made before ( http://bit.ly/2utYQAG ). The alternative one mentioned there, Lord Cornwallis (Phillipson's predecessor as Eye's MP, and his friend and political mentor), is I would imagine impossible as the uniform is wrong for him (he was never a cavalryman); he would also have been too young. I am puzzled by Phillipson's supposed colonelcy of the 1st Dragoons from 1775 (according to The History of Parliament http://bit.ly/2taFOjl ) - Lord Pembroke is widely given as Colonel of the regiment from 1764-94, and other reputable sources imply that Phillipson (often spelled Philipson) never rose above Lt-Col before leaving to raise the 20th. Would there have been any difference in uniform? Note that after a brief break Phillipson was again returned as the member for Eye between 1770 & his death in 1792. Sorry, Pieter, I got confused there with the plethora of Cornwallis members for Eye (which was for a hundred years the family pocket borough, and one or both of its two members often from the family). General (Charles) Lord Cornwallis (1738 – 1805) was indeed the power behind Phillipson, and had himself been an MP for Eye for three years before being called to the Lords in Dec 1762. But as you say it is his uncle Lt-Genl Edward Cornwallis (1713-76), and MP for the borough 1743-49, who is the alternative suggestion for the sitter in the portrait - and of course though of a more suitable age, the same objections to him on uniform grounds remain. Thanks Osmund: assuming its as straightforward an identification as it looks I hope for an early resolution. Like so many items I raised it a long time ago, it has been long delayed in even becoming visible, has had an admirably fast answer, and I hope won't stay open-ended for yet more weeks. I assume a suitable title might be 'Colonel Richard Burton Phillipson, c.1723-92, Ist (Royal) Regiment of Dragoons, and MP for Eye', noting he later made lieutenant-general -which I now realise is above a major-general: funny how one can miss these things for decades until some odd circumstance makes the point it reverses the normal hierarchy of major above lieutenant. The resemblance between Dance’s portrait of Phillipson and Reynolds’s portraits of Lord Pembroke is certainly confusing and close enough to suggest this may have been an intentional reference. The issue of the Colonelcy of a regiment vs. the actual army rank of Colonel has only added to the confusion in this case. The Colonelcy of a regiment was to some degree an honorary position, almost always granted to officers of General’s rank. Lord Pembroke, as a Major General, obtained the colonelcy of the 1st Royal Dragoons in 1764. The actual day to day command of a regiment, however, was held by a Lieutenant Colonel or a Colonel. Philllipson was promoted Lt. Colonel in the 1st Royal Dragoons in 1771, Colonel in 1775 and then out of the 1st Royal Dragoons in February 1779 when he became a Major General. He obtained the Colonelcy of the newly raised 20th Light Dragoons in April 1779, and after they were disbanded, the Colonelcy of the 3rd Dragoon Guards in 1785. The colonelcies of more senior regiments were considered more desirable, as they were less likely to be disbanded, and with it the loss of the associated emoluments. General officers who were particularly active as the Colonel of their regiment would sometimes where their uniform, as in Pembroke’s case. Prior to 1791 regimental uniforms usually displayed no distinctions in rank between the lowest commissioned ranks of Ensign (Cornet, in the cavalry) and the highest regimental rank of Colonel. A more specific title, in terms of date, would be 'Colonel Richard Burton Phillipson, c.1770 - 1779, Ist (Royal) Regiment of Dragoons, and MP for Eye'. The uniform is clearly that of the 1st Royal Dragoons but the painting cannot post-date 1779, as Phillipson was promoted out of the regiment in that year. Something else is puzzling me here, Christopher, which I hope you can also clarify. Although there were generally no distinctions of rank on the uniforms of regimental officers before 1791, I understood that from (? )1767 General officers had (or were supposed to have) varying numbers and spacings of laces on their sleeves according to rank. It may be that I am misreading what I see, but in both versions of the portrait the sitter seems to me to have four sleeve laces, evenly-spaced, which would surely imply a rank in the army of full General (whatever their regimental rank)? Though I have found few from the 1770s, I've noted many such rank laces on the sleeves of sitters in other portraits I've found while researching this, almost all of them consistent with their ranks of General down to Major General (and, rarely, Brigadier General) at the time. Since Phillipson was never a full General, this seems problematic. I suppose if the artist(s) were careless in their depiction, the four laces in separated pairs of a Major General might have been intended - but even then we have a problem, as his promotion to Maj. Gen. only came with his move to the 20th Light Dragoons. My apologies, Christopher: after a bit more digging I can probably answer that myself. Confusing though it is to the ignorant like me, I find (I think) that the officer's coat sleeves of the 1st Royal Dragoons also bore four equally-spaced gold-lace chevrons, indicating (as you originally said) the regiment, not the rank. And the coat is not that of a General officer (which I assume is always quite different), but a 1768 cavalry officer's one of Dragoons-type (no lapels, notched cuffs, single epaulette), with the dark blue facings at cuff and collar of a 'Royal' regiment. Is that more or less right? Yes - you are clearly a quick study! The regulations concerning display of rank for generals referred to their "frock" uniform coat, not to any regimental uniform they may also have worn. Feel free to contact me directly for military related questions - Christopher at caplines dot com. Thanks very much for that, Christopher. Re the artist, I am not sure an attribution to Dance(-Holland) himself for Eye's version is justified. Putting the two alongside each other (see attached), even at the very poor resolution available for the Sotheby's version, it's evident to me that it is not only by a different hand, but seems rather better - especially in the subtler handling of the face. If the Sotheby's one is indeed signed by Dance, then I think this must be a copy rather than a studio repetition. I will try and get to the Heinz Archive this week to look for information on the Sotheby's sale (and anything else), and to confirm that the one there was signed - if we're lucky there may be some provenance. Can I ask the Collection if they know how and when their version came to Eye? Should be we looking for a Suffolk artist as the copyist? I hadn't considered more than the subject but agree, in general terms rather than just on Osmund's direct comparison with the Sotheby version, that the quality looks more mechanically 'after' Dance than by him. My eye has just been caught by your little piece on the portrait of the slightly rotund military gentleman in a red coat and white waistcoat. The picture is clearly a copy or version of the portrait of Henry Herbert, 10th Earl of Pembroke the original of which is by Nathaniel Dance. It was sold as Lot 49 in the Sotheby's British Paintings Sale on 6.4.1993. It shows him as the colonel of the 1st (Royal) Dragoons, the regiment he commanded from 9th May 1764 to 28th January 1794. Pembroke eventually reached the rank of General, but this portrait shows him in the regimental uniform which would have been identical for all officers. The portrait dates from after the 1768 Clothing Regulations of 19th December. Prior to this date the collar would have been somewhat different - a shallow, stand-up collar in scarlet with a small dark blue rectangular patch on either side of the opening decorated in narrow gold lace or embroidery. The 1768 Regulations introduced "cape-collars" that sat low on the neck and extended onto the shoulders as here. The 10th Earl's son, George Augustus Herbert (11th Earl) is portrayed by Jean-Baptiste Greuze wearing exactly the same uniform - bust length in the Fitzwilliam Museum, Cambridge. At this period - the 1760s and up to the Napoleonic era - there were no rank badges or other specific distinctions that indicated the most junior regimental officer from the most senior. Such badges, worn on the epaulette straps were introduced in 1803 and gradually came into use thereafter. I cannot, I regret to say, offer any suggestions as to who the copy owned by Eye Town Council might have been by. Did Dance operate a studio or use known copyists? I hope these details are of service. Mr Cormack's analysis is all perfectly correct, but quite a lot of it has already been mentioned and addressed. I am grateful to him for giving us the exact details of the 1993 Sotheby's sale of Dance's (? )prime version, but unfortunately he does not confirm that it was catalogued as "signed", nor does he mention if there was any provenance given to support the identification as Lord Pembroke – it may be that it was just the auctioneers' (quite intelligent) conclusion based on the uniform and the similarity to Pembroke's earlier (mid-1760s) portrait by Reynolds. We just don't know, and I still need to go the Heinz Archive to check these points, as well as any other images they may have of Pembroke a bit later in life...or of course of Phillipson. Unfortunately the Heinz is now open only three days a week (recently reduced from four), and I keep missing it! Christopher Bryant will correct me if I'm wrong, but prima facie (on uniform grounds) I don't think there is any reason why it could not be either man. But there are two objections to Pembroke. The first is age – Dance is stated by Waterhouse and others to have given up portrait painting in 1782. The DNB relates "At some time in the 1770s Dance became financially independent. Although he stopped exhibiting professionally in 1776 and produced fewer paintings, he was still active professionally ... However, in 1782 he gave up his studio and moved to Cranbury Park, Hampshire—the home of a widow, Mrs Harriet Dummer ... she had an income of £18,000 per annum. They were married in London on 17 July 1783." Since the 10th Earl was born in 1734, it follows that he cannot have been more than 48 when the original portrait was painted (if confirmed as by Dance). Is this plausible? Phillipson was an older man – born c.1723, he would have been in his mid-50s in the late 1770s, the period suggested for this work. The second objection is purely circumstantial, but powerful. Why on earth would Eye Town Council have acquired a copy portrait of Lord Pembroke, when (as far as I can find) neither the Earl nor his family had any connection with the town or indeed the county? Phillipson (formerly Burton), on the other hand, was a Suffolk man by birth and residence, and he was one of the two Member of Parliament for Eye 1763-1768, and again from 1770 until his death in 1792. It seems eminently likely to me that the Borough could have had painted or been given a copy of their own MP's portrait – an MP who was installed without contest in the pocket borough by the Cornwallises who owned most of it, and who were by far the most influential family in the vicinity. If Mr Cormack would like to discuss this further, it might be simpler for the exchange of ideas if he could join the forum and post here. I for one would welcome the presence of another specialist in military history. In case the first request became invisible in the verbage, can I ask again if the Collection has any more information on when and/or how the painting came to Eye? Any sense at all of how long it has (or had if it's no longer there) been in the Town Hall would be helpful, as would any earlier title it may have been known by – even if was just 'unknown'. Neatly put Osmund: if the military experts agree (?) the uniform would fit either man the key point in terms of sitter identity is that in the canvas sold at Sotheby's in 1993. 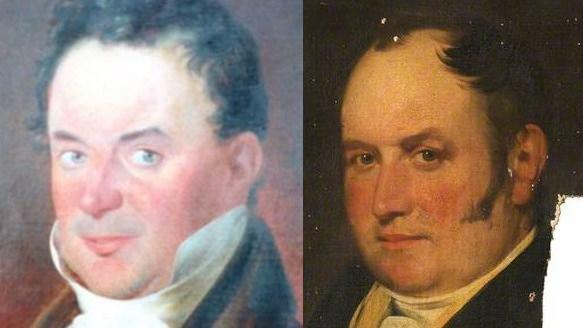 The heads of both men are similar but the earlier Reynolds portraits of Pembroke suggests a slightly squarer one with a straighter nose line (even slightly concave and thinner) and longer/ wider eyebrows. Both 'Sotheby 93' and the Eye copy seem to have a more bridged nose and more tufted brows. Its also a choice between ages: Pembroke at c. 48 (based on Dance's chronology) and Phillipson at about 56, max, (before he changed regiment), plus the circumstantial case that Pembroke had no connection with Eye or Suffolk but Phillipson did. I find to my embarrassment that I had a copy of the 1993 Sotheby’s catalogue all along , and the portrait is indeed signed: scan attached. David Goodreau (in his 1973 Ph.D. thesis, the only known monograph on Nathaniel Dance) apparently dates it to circa 1777, when Phillipson was about 54...and Pembroke just 43! This date is of course precisely in line with Christopher Bryant’s suggested one of the (probably late) 1770s. The painting also passed through Christie’s in February 1949. The scan is about as high-res as the printing allows, and enables us to see rather more detail of the sitter’s face. To my eye it pushes his possible age-range up somewhat – note especially the slightly shrunk-back lips and perioral wrinkles, which I would be surprised to see on a man of 43 unless somebody had knocked all his front teeth out. Sotheby’s were nevertheless clearly very confident in their identification of the sitter as Lord Pembroke. But whether that was from their own research, from that of Dr Goodreau, or from what was given in the 1949 sale catalogue – or all three – we don’t yet know. Certainly it’s possible that the sitter was unknown in 1949 – this earlier auction appearance may have been deduced by Sotheby’s from an old Christie’s stencil number on the back, not from the title. Anyway, I have written to Christie’s Archive (they have always been very helpful), and will report back. 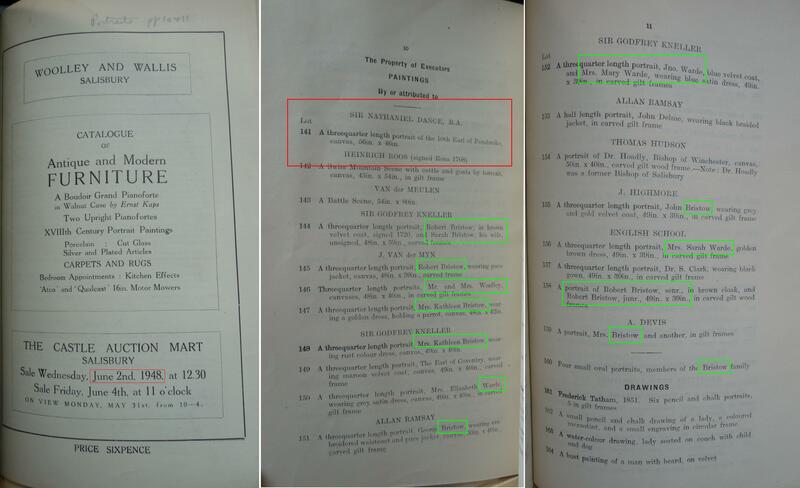 The sale was 68 years ago, so we may even be able to get a vendor’s name – is the cut-off point 50 years, I can’t remember? I have also tracked down a copy of the Goodreau doctoral thesis at the Paul Mellon Library, and will be going to look at that on Tuesday morning (followed by the boxes at the Heinz). Mellon may also have a copy of the 1949 catalogue. Osmund, I had information not long ago from the Christie's Archive which related to a sale in the 1940s so unless things have altered in the very recent past Christie's should be able to help with your enquiry. My money is on misidentification of Pembroke, probably long-standing: simply age, supported by the likeness points already made. Even 18th-century military and/or indulgent living doesn't have that outcome on someone of c. 43.The attached show Augustus Keppel by Reynolds : (1) in 1749 when he was 24 (and having already lost many of his teeth to scurvy going round the world with Anson); (2) at 40 in 1765, and (3) in 1779 when he was showing the symptoms wear and tear at 54. There are other versions of the latter two. Thanks, Pieter, most interesting comparisons. But we can now move to something more solid - I think I’ve found the link and the proof. David Goodreau’s 1973 doctoral thesis on Dance was of little help – there is one short mention of the portrait, in his list of those assigned dates on stylistic grounds (c.1777 - attachment 1). It is there called ‘Henry Herbert, 10th Earl of Pembroke’, though to DG’s credit he has added a question mark. He must have seen the photograph in the boxes at the Heinz, apparently sent to the NPG by Christie’s in 1949, though not illustrated in the catalogue of the sale on the 18th Feb – attachment 2. It was again identified as Pembroke. Christie’s Archives (thank you, Lynda McLeod) had no information about how or why it was so identified, but were happy to reveal that the vendor was the dealer W.M. Sabin & Son, and that it was bought in at 18 gns (against a reserve of £35) and returned to them after the sale. I was bracing myself for a search for any Sabin records still in existence, when the 10th Earl’s folder in the Heinz’s boxes came up trumps: another photo of it sent in by Woolley & Wallis in May 1948. 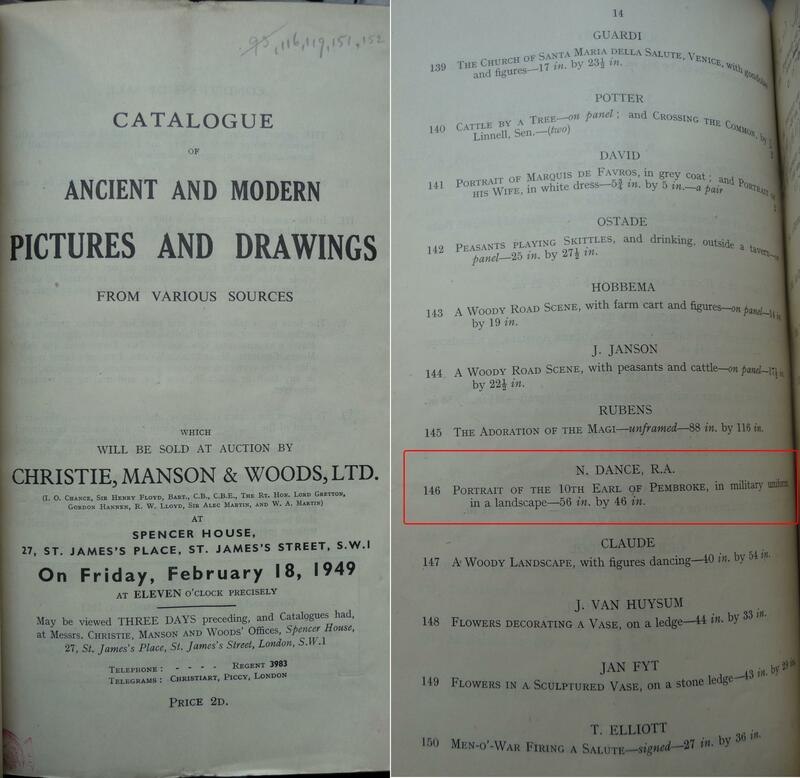 The Heinz also have very full runs of bound catalogues, and miraculously among them was the W&W sale of 2/6/1948 in which the portrait appears – a mixed sale, various unidentified vendors, unillustrated, the painting once more identified as Pembroke. By then I was beginning to think it might be him after all – and unless W&W have surviving and accessible records, I couldn’t see how we were going to prove it either way. But then I realized that the two pages of portraits in the sale all seemed to be from one source; “The Property of Executors” heading which I’d assumed referred to several was probably just one. Not only that, but the vast majority had identified sitters – mostly from one family, Bristow, with two called Woolley and four Warde (plus a sprinkling of others including the Earl of Pembroke). See attached 3. The relationships between the various parties is indeed complex, and best understood in the attached chart I’ve prepared from many sources, including wills, overlaid on a basic Phillipson pedigree (with many errors) I found online. Col. (later Lt.Gen.) 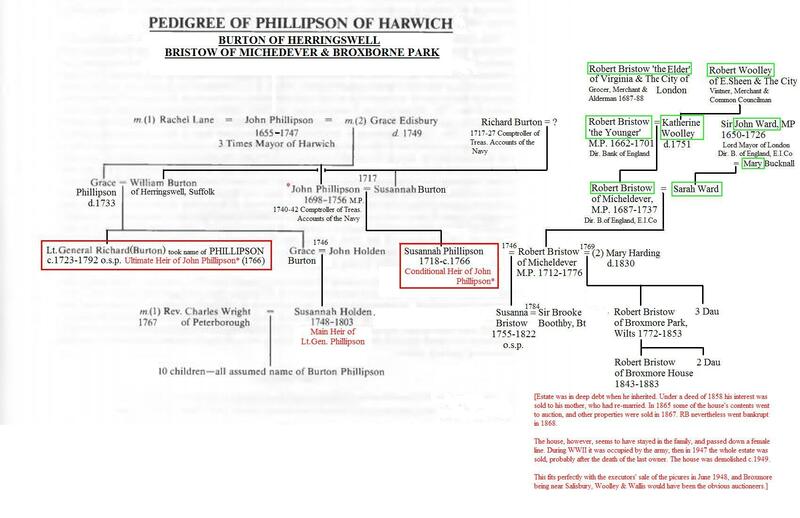 Richard Phillipson (originally Burton) was the nephew of John Phillipson [“JP”] of Harwich (d.1756); Susannah Phillipson was JP’s daughter. JP’s will made Susannah his heir, but the inheritance was conditional on her having male issue, in default of which Col. Phillipson was to inherit. Whoever ultimately inherited, they were to change their name and arms to ‘Phillipson’ – the Colonel did so in 1766, and in due course *his* heirs, the descendants of his niece Susannah Wright (née Holden), did so as well. The Colonel was actually a double-first cousin of Susannah Phillipson, and they were doubtless close – his mother was the sister of her father, and her mother was the sister of his father. In 1746 Susannah Phillipson married (as his first wife) Robert Bristow of Micheldever (d.1776). I have ringed in green all the ancestors of Robert who appear as sitters in the Woolley & Wallis catalogue. The Bristows’ later home, Broxmore House, ultimately descended in a female line, and was sold (and subsequently demolished) at the end of Nov 1947. The W&W auction of the portraits, including Col. Phillipson by Nathaniel Dance (by now misidentified), took place six months later. It is a little surprising that the portrait does not appear to have passed to the Colonel's niece and heir, Susannah Wright (née Holden), and thence to her descendants the Burton Phillipsons (perhaps they own another version?). His double-cousin Susannah Bristow (née Phillipson, d.c.1766) had died before it was painted, but perhaps it ended up with her daughter and only child Lady Boothby (née Susanna Bristow); by the time she died in 1822 without living issue it might have lost its identity, and could easily have been sent to the Bristows at Broxmore on the assumption that it was something to do with their family. Even without knowing *exactly* how it ended up at Broxmore, I feel that the close family connection is strong enough to provide a convincing provenance – one that to my mind removes any lingering doubt that the Dance portrait might be of the Earl of Pembroke, not of Col. Phillipson. How it came to be identified as Pembroke will remain a mystery: Wilton is not that far from Broxmore (about 15 miles), and an unrecorded local friendship may have been assumed – but in fact during the 10th Earl’s lifetime the Bristows were still at Micheldever, which is much further off. 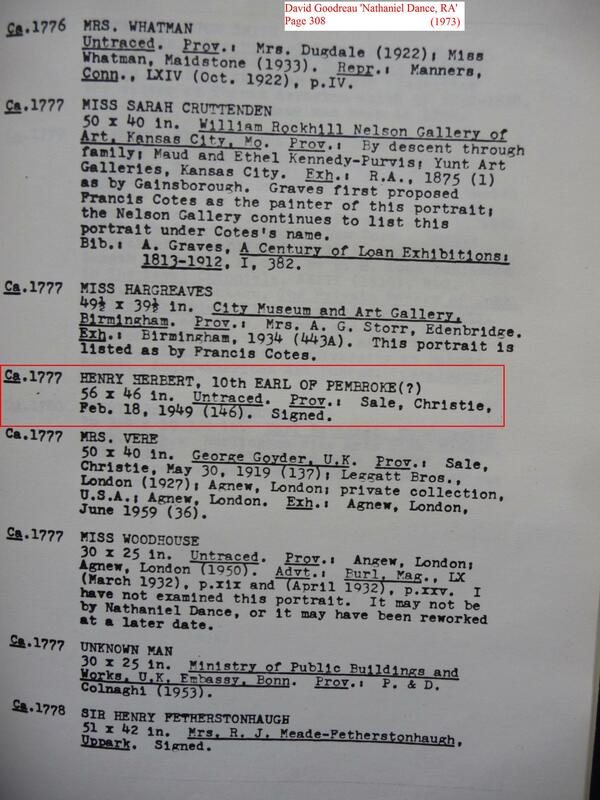 It is perhaps worth noting that though the Pembrokes would certainly have been advised by Sotheby’s of its appearance at the 1993 Sale, they do not seem to have wanted to buy it (it is not at Wilton) – pretty odd if it was an important unknown portrait of a previous Earl. That's very impressive Osmund: it is irritating that the (clearly old) Pembroke identification can't be explained -though possibly something as simple as you suggest and/or the fact he also had the Ist Dragoons colonelcy (and uniform) at an adjacent date and - given supercial likenesses with the younger Pembroke images by Reynolds - 2+2 were carelessly added at some point after both men's deaths to make 5. As already mentioned, I think the superficial likeness with Pembroke is misleading, especially when taking disparate ages into acccount, and you have already pointed out he had no Suffolk connection and Eye no reason to have a portrait of him. You convince me that Christopher Bryant's original suggestion 'has legs', but its not my call. The “via Lady Boothby” hypothesis is given considerable weight by the discovery that after the 1791 death of her beloved five-year-old daughter and only child Penelope (famously painted by Reynolds two or three years before), followed by the emotional collapse of her husband Sir Brooke and the couple's estrangement, Susanna returned to live with her half-brother Robert Bristow and siblings at Micheldever. She later moved to a small house in Dover, but remained close to Robert (by now at Broxmore) until her death in the town in 1822, when she left him, her executor, most of her few remaining chattels. Sir Brooke, meanwhile, had been forced by debt to move out of (and let) their Derbyshire estate (Susanna's large dowry had paid to remodel it); after wandering the Continent for 30 years, he died “in reduced circumstances” at Boulogne (?Brussels) a year after his wife. Under this combination of circumstances it is entirely logical that any large family portrait owned by Susanna would have ended up on the large and accommodating walls of Broxmore Park. Finally I’ll return to the portrait under discussion, the copy at Eye. My guess is that it was owned by his old friend and benefactor, General Lord Cornwallis, and hung at Lord C’s family seat (but less favoured residence) near Eye, Brome Hall. Brome (and a neighbouring house, Oakley Park) was sold to the Kerrison family after the next (and last) Marquis Cornwallis’s death in 1823. Lesser portraits quite commonly remained in situ when big houses were sold, especially if it was to 'new money' (which the Kerrisons were). The most valuable ones might be sent up to auction in London, or distributed to relations (the good Cornwallis portraits in fact ended up at Audley End via a daughter). But this one was neither family nor valuable, and could well have stayed on the wall at Brome. The Kerrisons in due course died out in the male line, but a daughter, Lady Bateman, lived at Brome until her death in 1918. The estate was subsequently sold to even newer money, the Tacon family, who were brewers at Eye. They remained there in the person of an unmarried daughter, Maude, until her death in 1952, after which Brome Hall was sold to a local farmer and demolished. Lady Bateman’s portrait was at some point given to Eye (apparently by her family), as was the larger Archer Shee portrait of her father Sir Edward Kerrison, 1st Baronet. The other half-length one of him is posthumous, painted by a local artist for the opening of the new Town Hall in May 1857. See attachment. Two Tacon portraits also ended up there: http://bit.ly/2eGxg0m . It is easy to see how Phillipson’s portrait might have arrived at Eye in the same way. There is circumstantial support for this idea, too. I found an unpublished memoir online written by Maud Milgate, a lady who travelled through Norfolk & Suffolk in the 1950s & 60s seeking evidence for her supposed descent from the Cornwallises. In around 1960 she made a visit to Eye, and met a former multiple Mayor and Councillor of the town aged 90+ (and resident there since 1887), who told her there was a Cornwallis portrait in the Town Hall. She went to investigate, and the Town Clerk confirmed there was indeed a portrait of a Cornwallis in the Council Chamber. She was taken up to look at it – it was without question our portrait – and invited to identify the sitter: her guess of the 1st Marquis was reasonable enough without specialist knowledge. See http://bit.ly/2vPyFVy . But this traditional identification as a Cornwallis is most significant, and to me strongly suggests that the painting came from a local Cornwallis house in the early/mid-C20th – or just possibly from the Cornwallises themselves rather earlier. Could Art UK please ask Eye directly what acquisition (or other) information they have for their picture -however minimal? We have contacted the collection and will relay any new information we receive. The collection does not have any further information on this painting. Just a small thing about rank. Someone says: "Lieutenant General of the Prince of Wales Regiment of Dragoon Guards', though this step down - I think- from Major-General" As I understand it Major General is an abbreviation of Sergeant Major General, and is therefore lower than Lieutenant General. Pat, you are of course right about the relative positions of those two general officer ranks, and indeed the origins of the name 'Major-general'. However, to be fair to the man who made the mistake, if you look four posts further down you'll see that he acknowledged and corrected the error himself! 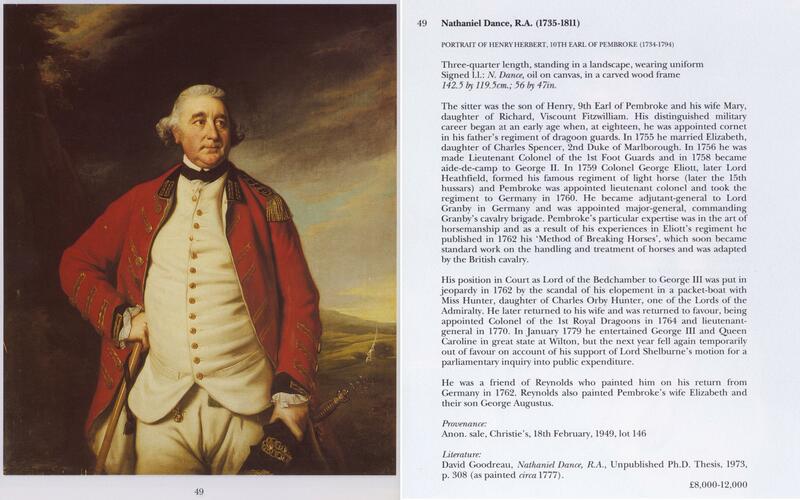 Thanks: I think this could now be wound up confirming the sitter is indeed Lieutenant-General Richard Burton Phillipson (c.1723- 1792) shown when Colonel of the 1st (or Royal) Regiment of Dragoons from 1744 to 1779, and who also served as M.P. for Eye, 1762-68 and 1770-92, in the local Cornwallis interest. Also that it is after Nathaniel Dance, c.1777, the original being last seen when sold at Sotheby's as lot 49 in their British Paintings sale (London) of 6 April 1993 (https://static.artuk.org/_source/1993-catalogue-scan.jpg) though at that point still long but wrongly identified as Henry Henry Herbert, 10th Earl of Pembroke. Thanks largely to Osmund, we also have a circumstantial but probable family provenance trail, and while Eye say they can add nothing I suspect that delving into probably early 20th-century council minutes might reveal acknowledgement of it as a gift. Perhaps that is something this discussion may encourage some local interest in pursuing, assuming not already done. If the relevant portraits leader agrees perhaps a formal recommendation on the lines above could be made. Burton's promotions were: cornet Sir Robert Rich's Dragoons 1744 (to Duke of Kingston's Horse 1746), lieutenant 1st Dragoons 1746, captain-lieutenant 1750, captain 1751, major 1759, lieutenant-colonel 1761 (back to 1st Dragoons 1771), colonel 1775 (to 20th Dragoons 1779-85), major-general 1779, (colonel 3rd Dragoon Guards 1785-1792), lieutenant-general 1787. He changed his name by Act of Parliament to Burton Phillipson (his mother's maiden name) in 1766. He became an M.P. in 1762, sat for 28 years, and never said a single word in parliament. I concur with Pieter that this discussion should now be closed, as there is now a full identification of the sitter, his dates of service, uniform and history. We have an attribution, a probable provenance (with a further avenue to be pursued by the owner, if desired), so unless the original work by Dance were to surface (Bendor? ), this lively debate, with thanks to Chris, Osmund and also Andrew (Cormack) could be happily terminated. The collection has accepted this recommendation. The sitter is Lieutenant General Richard Burton Phillipson (c.1723–1792), shown when Colonel of the 1st (or Royal) Regiment of Dragoons from 1744 to 1779. Phillipson also served as Member of Parliament for Eye between 1762–1768 and 1770–1792, in the local Cornwallis interest.